DAVID VICTOR FORMERLY OF BOSTON | Love Productions Inc.
Few bands can lay claim to featuring a former member of a legendary classic rock band with a #1 hit from the band: DAVID VICTOR is a former member of BOSTON, performing vocals and guitar for one of the most successful American rock bands of all-time on multiple tours and was featured lead vocalist on BOSTONS’s #1 Classic Rock hit, “Heaven On Earth” in 2014. 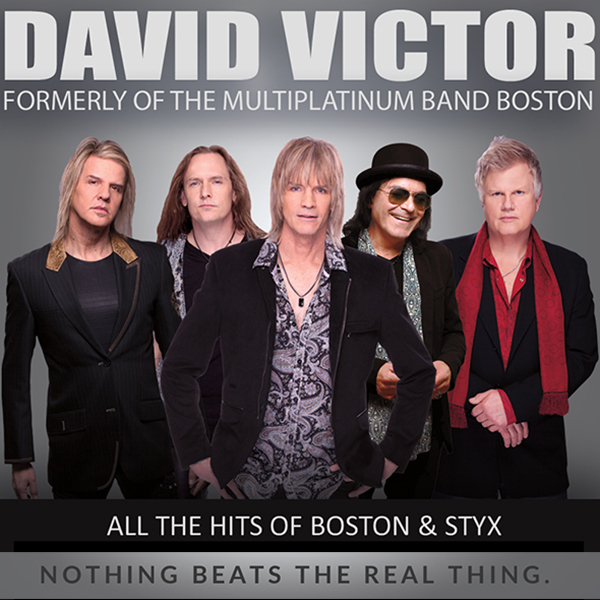 DAVID VICTOR formerly of BOSTON: The Hits of Boston & Styx brings to life all the power and polish of BOSTON as well as the sweet progressive sounds of STYX in one amazing show. This show is a full-throttle rock concert experience on par with the classic bands themselves. And all 100% LIVE.